Not to be confused with La Soufrière (volcano), La Grande Soufrière, or Qualibou. The Soufrière Hills volcano is an active, complex stratovolcano with many lava domes forming its summit on the Caribbean island of Montserrat. Many volcanoes in the Caribbean are named Soufrière (French: "sulphur outlet"). 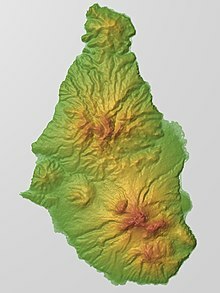 These include La Soufrière or Soufrière Saint Vincent on the island of Saint Vincent and La Grande Soufrière on Guadeloupe. After a long period of dormancy, the Soufrière Hills volcano became active in 1995 and has continued to erupt ever since. Its eruptions have rendered more than half of Montserrat uninhabitable, destroying the capital city, Plymouth, and causing widespread evacuations: about two thirds of the population have left the island. It is andesitic in nature, and the current pattern of activity includes periods of lava dome growth, punctuated by brief episodes of dome collapse which result in pyroclastic flows, ash venting, and explosive eruption. The volcano is monitored by the Montserrat Volcano Observatory. Volcanic gas emissions from this volcano are measured by a Multi-Component Gas Analyzer System, which detects pre-eruptive degassing of rising magmas, improving prediction of volcanic activity. 1550 CE (± 50 years): Between 25 and 65 million cubic metres of lava was erupted at Castle Peak. Seismic activity had occurred in 1897–1898, 1933–1937, and again in 1966–1967, but the eruption that began on 18 July 1995 was the first since the turn of the 20th century in Montserrat. When pyroclastic flows and mudflows began occurring regularly, the capital, Plymouth, was evacuated, and a few weeks later a pyroclastic flow covered the city in several metres of debris. The first phreatic explosion in this new period of activity occurred on 21 August 1995, and such activity lasted for 18 weeks until it caused an andesitic lava dome formation. This was initially confined by a sector-collapse scar. This period lasted for another 60 weeks, after which there were major dome collapses and two periods of explosive volcanic eruptions and fountain-collapse pyroclastic flows. The explosion blanketed Plymouth, 6 kilometres (3.7 mi) away, in a thick layer of ash and darkened the sky almost completely. Earthquakes continued to occur in three epicenter zones: beneath the Soufrière Hills volcano, in the ridge running to the north-east, and beneath St George's Hill, about 5 kilometres (3.1 mi) to the north-west. A large eruption on 25 June 1997 resulted in the deaths of nineteen people. The island's airport was directly in the path of the main pyroclastic flow and was completely destroyed. Montserrat's tourist industry also crashed, although it began to recover within fifteen years. The governments of the United Kingdom and Montserrat led the aid effort, including a £41 million package provided to the people of Montserrat; however, riots followed as the people protested that the British Government was not doing enough to aid relief. The riots followed a £10 million aid offer by International Development Secretary Clare Short, prompting the resignation of Bertrand Osborne, then Chief Minister of Montserrat, after allegations of being too pro-British and not demanding a better offer. The British destroyer HMS Liverpool took a large role in evacuating Montserrat's population to other islands; this included Antigua and Barbuda, who warned they would not be able to cope with many more refugees. About 7,000 people, or two-thirds of the population, left Montserrat; 4,000 went to the United Kingdom. The following is a list of Montserrat settlements abandoned after the eruption of the Soufrière Hills volcano. Most of these settlements were badly affected or inundated by pyroclastic flows between June and December 1997. On 24 December 2006, streaks of red from the pyroclastic flows became visible. On 8 January 2007, an evacuation order was issued for areas in the Lower Belham Valley, affecting an additional 100 people. At 11:27 pm local time on Monday 28 July 2008, an eruption began without any precursory activity. Pyroclastic flow lobes reached Plymouth. These involved juvenile material originating in the collapse of the eruption column. Further, a small part of the eastern side of the lava dome collapsed, generating a pyroclastic flow in Tar River Valley. Several large explosions were registered, with the largest at approximately 11:38 pm. The height of the ash column was estimated at 12,000 m (40,000 ft) above sea level. 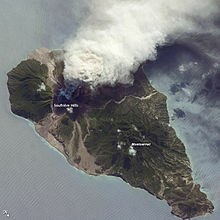 The 9 October 2008 issue of the journal Science suggests that two interconnected magma chambers lie beneath the surface of the volcano on Montserrat – one six kilometres below the surface and the other at 12 kilometres below the surface. They also show a link between surface behaviour and the size of the deeper magma chamber. On 5 February 2010, a vulcanian explosion simultaneously propelled pyroclastic flows down several sides of the mountain, and on 11 February 2010, a partial collapse of the lava dome sent large ash clouds over sections of several nearby islands including Guadeloupe and Antigua. Inhabited areas of Montserrat itself received very little ash accumulation through either event. ^ a b This elevation is for Chance's Peak, the traditional high point. However the lava dome in English's Crater is currently estimated at over 930 m (2006): see The CIA World Factbook on Montserrat. ^ "Soufrière Hills". Global Volcanism Program. Smithsonian Institution. Retrieved 15 February 2016. ^ Christopher, Thomas; Edmonds, Marie; Humphreys, Madeleine C. S.; Herd, Richard A. (2010). "Volcanic gas emisions from Soufrière Hills Volcano, Monserrat 1995-2009, with implications for mafic magma supply and degassing, Geophysical Research Letters, Vol. 37" (PDF). Geophysical Research Letters. 37 (19): n/a. doi:10.1029/2009GL041325. ^ a b "Global Volcanism Program: Eruptive history". ^ "Soufrière Hills". Global Volcanism Program. Smithsonian Institution. ^ B. Peter Kokelaar (2002). The eruption of Soufrière Hills volcano, Montserrat, from 1995 to 1999. p. 1. ISBN 978-1-86239-098-0. ^ Vi︠a︡cheslav Moiseevich Zobin (2003). "Soufrière Hills volcano, Monserrat (6.2.3.)". Introduction to volcanic seismology. 6. pp. 104–7. ISBN 978-0-444-51340-3. ^ "BBC country profile: Montserrat". BBC News. 22 September 2009. Retrieved 8 March 2008. ^ "Montserrat tourism arrivals up 22 percent in first seven months of 2010 | Caribbean news, Entertainment, Fashion, Politics, Business, Sports…". www.thewestindiannews.com. Retrieved 18 May 2015. ^ "UK citizenship for island outposts". The Guardian. London. 18 March 1999. Retrieved 23 May 2010. ^ a b "Montserrat Chief Minister Resigns As People Reject Aid Offer". Politics '97. BBC. Retrieved November 1, 2010. ^ Elsworth, D; Mattioli, G; Taron, J; Voight, B; Herd, R (October 2008). "Implications of Magma Transfer Between Multiple Reservoirs on Eruption Cycling". Science. 322 (5899): 246–248. Bibcode:2008Sci...322..246E. doi:10.1126/science.1161297. PMID 18845752. Retrieved 2008-10-09. ^ "Multiple Magma Reservoirs Affect Volcanic Eruption Cycles", Newswise, 6 October 2008. Retrieved 9 October 2008. ^ "Montserrat Volcano Observatory". Montserratvolcanoobservatory.info. Retrieved 27 June 2014. Wikimedia Commons has media related to Soufrière Hills. Montserrat Volcano Observatory (MVO) - Current monitoring of the Soufrière Hills Volcano in Montserrat. This page was last edited on 24 April 2019, at 11:30 (UTC).